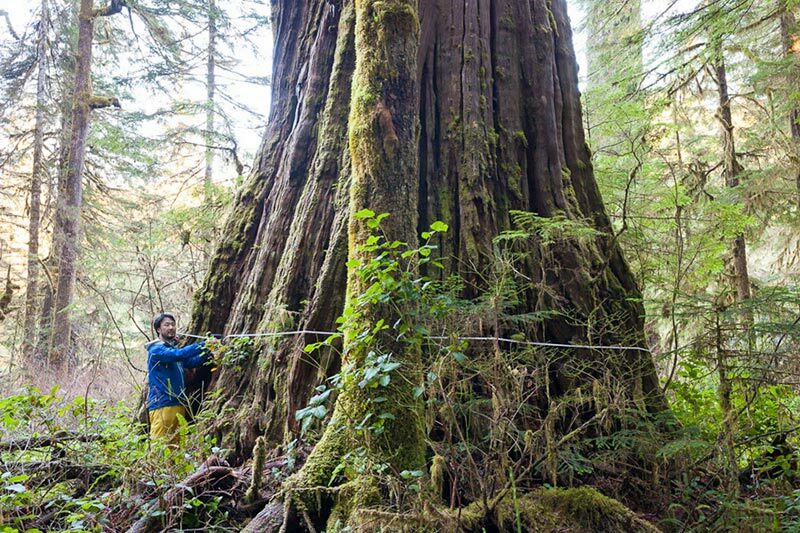 Conservationists with the Ancient Forest Alliance have located and measured two huge western red cedar trees, one of which makes it into the top 10 widest red cedars in BC, in the endangered Central Walbran Valley on Vancouver Island, British Columbia. 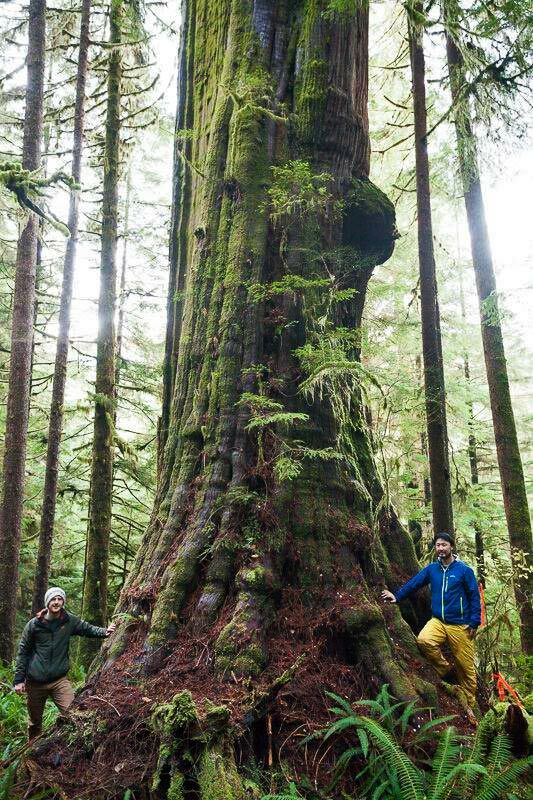 The Tolkien Giant comes in as the 9th widest western red cedar in BC, according to the BC Big Tree Registry. The Tolkien Giant has been tentatively measured at 14.4 metres (47 feet) in circumference or 4.6 meters (15 feet) in diameter, and about 42 meters (138 feet) in height. Another tree, the “Karst Giant” has been tentatively measured at 12.1 meters (40 feet) in circumference or 3.9 meters (13 feet) in diameter (no height measurement yet) and although it does not make the top 10, it is still an exceptional tree. “In the giant trees and in the soil, the old-growth temperate rainforests on Vancouver Island store more carbon per hectare than even tropical rainforests do – and massive amounts of carbon are released when they are logged and converted into second-growth tree plantations, which will take 200 years of growth to re-sequester the lost carbon,” stated Ken Wu, Ancient Forest Alliance executive director. The Tolkien Giant lies within a narrow and tenuous forest reserve (an Old-Growth Management Area), but logging is planned in the old-growth forest on the adjacent slope, including in the grove where the Karst Giant is found. The Karst Giant is found exactly on the boundary of a proposed cutblock and it is unclear whether or not it will be cut or left standing (but even if left standing, it would be exposed to being blown down by the fierce winter winds through the adjacent clearcut). The source article contains more information on Ancient Forest Alliance’s calls on Premier Clark to Counteract Climate Change by Protecting Old-Growth Forests. Featured Photo: AFA’s Ken Wu measuring the Tolkien Giant in the Central Walbran Valley. Bottom Photo: TJ and Ken beside the Karst Giant in the Central Walbran Valley. When I see these giants I begin to weep. They are our ancestors! Let them live.